Today's post is a little different, it's not the normal kind of review I do but I promise you it's good and there is a Giveaway at the end! 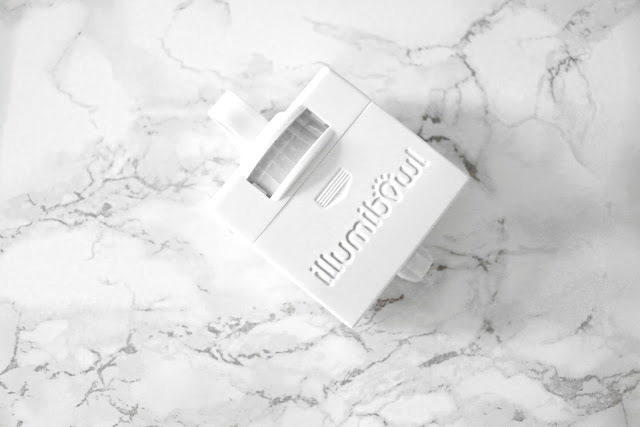 I was given the chance to review the Illumibowl, a fantastic little gadget that will inject just enough light into your bathroom at night so you don't have to go putting any harsh lights on that may wake you up more. You know those nights when you have to get up and go to the toilet but you don't want to turn the light on because it will be too bright? 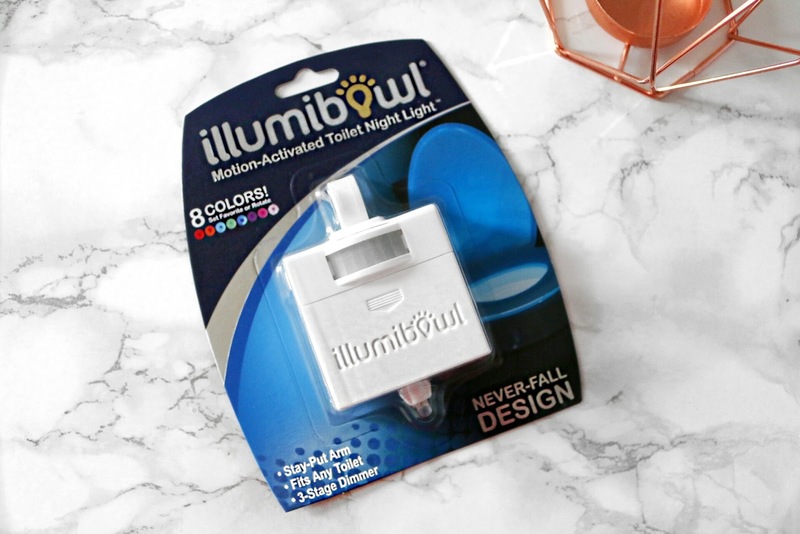 Well, Illumibowl has you covered! This awesome little gadget gives you just enough light and makes it fun because it changes colours, personally my favourite colour from them is the red! I have been doing potty training with Leon and I have been trying to get him used to going to the bathroom during the night if he needs to, this cool light has made it soooooo much easier to get him in there because he wants to see the "Magic Light" as he calls it. We put on the hall light if Leon's going to the toilet but in the bathroom it's still dark enough for this light to work, it's motion censored which means it won't be on during the day, only at night when it's dark and it detects movement and stays on until you leave. We when go into the bathroom it just makes things so much easier because you're not bombarded with harsh lighting which can sometimes wake you up more. 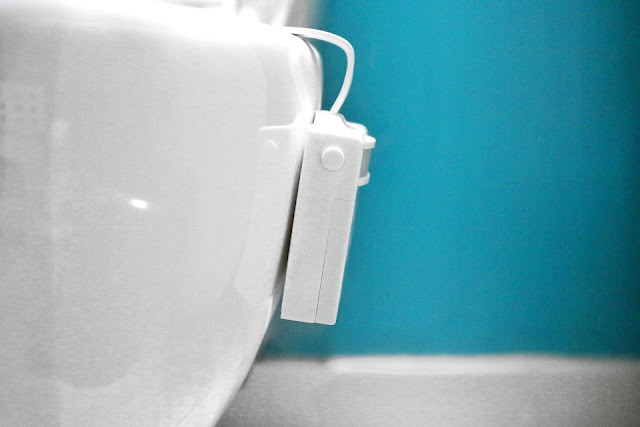 This little light fits on to any toilet, it's fully adjustable so you can put it on however you like and fits under the toilet seat so you don't even know it's there really. The light part shines into the toilet, lighting up the bowl. I've fitted mine to the side which is probably the best place to put it, it can detect movement easily from just before I enter the bathroom. Since having this little gadget I've not been putting on any lights at night and that's perfect to me, I'm one of those people that when the light goes on in find it incredibly hard to get back to sleep as I feel very awake, so this had fitted in well with my life. My grans also found it useful because she sometimes doesn't out her glasses on during the night to go to the toilet and the light is easily seen to her, she can get into the bathroom and use the toilet with no bother and doesn't have to put the upstairs light on anymore which isn't only annoying to her but also to Leon and I as the light in the landing is very very Bright. As you can see from the above picture, it just fits into the side and like I said it's fully adjustable, you just bend the long white bit to your desired size then clip it on. This picture also shows the little light bulb. The great thing about this I think is the fact you can set your colour cycle, like I said, my favourite colour is the red and this gadget has the option to either have a changing colour cycle or a static colour. Now personally I would either have the solid colour, probably the red or the blue but Leon loves watching the colours change so we keep it on that. There is a button on the side and to set the colour all you have to do is press it and the Illumibowl will stay on what ever colour is showing when you press it and then if you want to change it back to the changing colours cycle just simply press the button again, it's such an easy process and once you have done it a few times you'll be a problem at it. What I love about the Illumibowl is that it's so easy to use, you simply put batteries in, select which cycle you want and boom, it's done. What I would recommend though is setting it up at night when it's dark so you can easily see which colours are showing and you know it's going to work because when I first set mine up I done it in daylight, right under our skylight in the bathroom and I thought it was broken because no colours were showing haha so i went into the darkest room in the house and set it up, it worked perfectly, so I would recommend that but all the instructions are on the packaging. You can also adjust the brightness on it, just hold The button in on it until the brightness level changes, there are 3 brightness settings so you can control how light it is. Personally I like mine on the brightest because even on that, it's still no where near as bright and annoying as an actual household light. The Illumibowl also has a feature which alerts you to when the batteries need changing, the red colour will keep flashing to indicate that you need new batteries, once changed it should work fine and it takes AAA batteries. All in all I have LOVED this gadget. It has been a welcomed extra in our home that's for sure. It helps me get my son to the toilet at night, he wants to go see the magic lights, even if he doesn't always go to the toilet, he tells me he needs to go, we get up and he will try to use the toilet. It's fantastic how much this has worked. I am always getting up during the night so it's really perfect for me as I hate bright lights. I really recommend this to everyone and anyone! It's perfect to have in your home in my opinion, you can't go wrong with a light that's going to make going to the toilet much easier. I love that it's all fully customisable, the colour cycle, the fit, the brightness and the fact they send you a free replacement of your bulb stops working. All I have to say is I think it's worth it, especially if you have a little one. 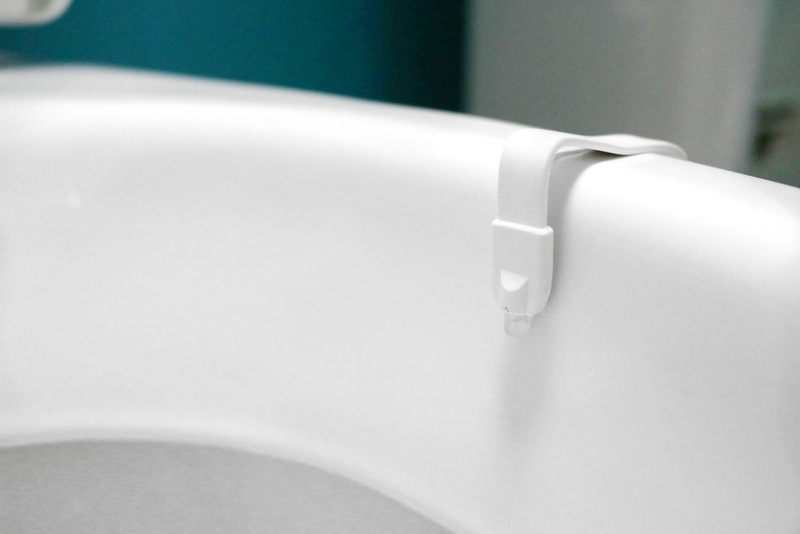 On their site they have potty training tips and more! So definitely check it out. 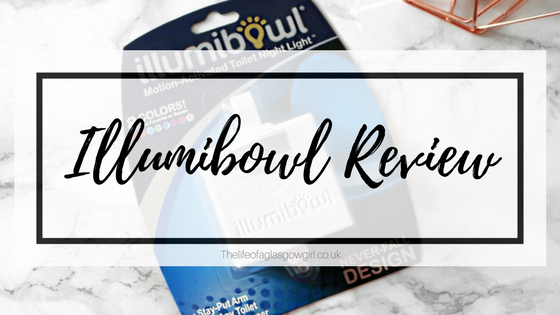 So now onto the BEST part, Illumibowl have given me the chance to run a giveaway for you lovely lot! There are many ways to enter which are all listen on rafflecopter, the basics? The more you do, the more chance you have of winning. GOOD LUCK! To be in with Winning one of these Illumibowls, Just enter the Prizedraw via the Rafflecopter link below. 1: The Prizedraw is Open to residents in the UK & US and must be 18 or older. 6: Your Information will NOT be given to anyone. 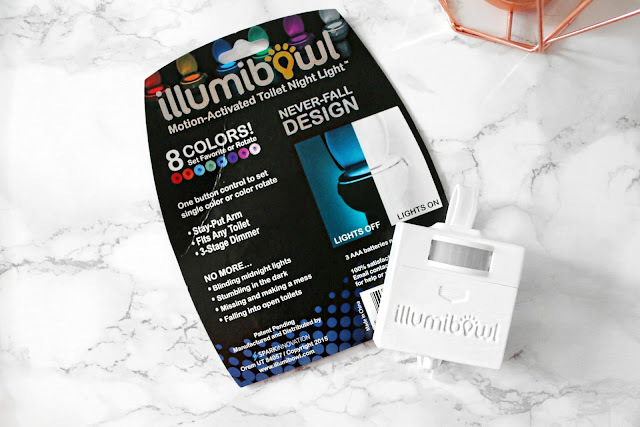 The Winner's Name and address will be given to Illumibowl for you to receive your prize. 7: Prize cannot be exchanged for money. Oh my! I've seen this on Twitter and wondered how it worked. It looks cool and my four year old would love it! I've never heard of this before but it sounds so good! I definitely need one of these in my flat for me and my partner, I hate getting up in the night and having to put all the lights on! Wow this gadget looks amazing I love quirky gadgets :) I have entered the giveaway. Brilliant idea and very fairly priced! I think this is absolutely brilliant and so handy not to wake the kids up who are extremely light sleepers. Very quirky, unique and brilliant!